All movie critics are asked two inevitable questions: (1) "How many movies do you see in a week?" and (2) "What's the greatest film of all time?" Gene Siskel found that it didn't matter what his reply to (1) was: "I can say one or a dozen--it doesn't matter. The real answer is between four and ten, but they don't really care." The answer to (2), as we all know, is "Citizen Kane." When naming that film, I sometimes even joke, "That's the official answer." The most respected "best film" list in the world is the one the UK film magazine "Sight & Sound" runs every 10 years. They poll the world's directors, critics, festival heads, archivists and others. Ever since 1962, the top film has been "Kane." If Welles became the poster boy for auteurs, his roller-coaster experiences later in his career demonstrated the hazards of such a position. From the time his second film, "The Magnificent Ambersons," had its ending destroyed by the studio, he became the favorite martyr of film critics. We could say: Look what he did when he had artistic freedom! Look what you did by mistreating him! Even his great "Touch of Evil" had its magnificent uninterrupted opening shot (now restored) hacked to pieces and re-scored. He sometimes said "The Trial" (1962) was his first film since "Kane" over which he had complete control. He segued into poster boy against all the forces against personal, independent, ground-breaking films. So it's settled: "Citizen Kane" is the official greatest film of all time, with Renoir's "The Rules of the Game" (1939) close on its heels. "Kane" is important both for itself and for what it symbolizes. But people don't always ask about the greatest film. They ask, "What's your favorite movie?" Again, I always answer with "Citizen Kane." But is that true, or only convenient? Let us agree that all lists of movies are nonsense. I have steadfastly refused to compose any list of films except for my annual Best 10 list, and the Sight & Sound poll--which has, after all, some real significance. Despite the entreaties of countless editors, authors and websites, I decline to make lists of the best comedies, horror films, Christmas films, family films, Westerns, musicals, political films, silent films, films about dogs, and so on. That way madness lies. Even more futile is a list of "favorite" films, although my Sight & Sound list sort of performs that function. I take delight in Jonathan Rosenbaum's reply to the question: "It would be whatever Carl Dreyer film I had seen again most recently." There's an answer that makes sense for me, although instead of Dreyer I might choose Bergman, Fellini, Herzog, Scorsese, Ozu, Hitchcock, Kurosawa, Keaton, or...you see what I mean, and I haven't even reached directors under 60. I get squirmy when people try to pin me down. The only truly honest answer is: I don't know. But I'll ask myself: What is my favorite film? Or I'll skew the question slightly: What film would I most like to see again right now? The answer would not be "Kane." After seeing it countless times and going through it a shot at a time, I dunno, 25 or 50 times, and recording a commentary track for it, I have sort of finished with it. I admire it enormously, but saints preserve me, it is not the movie I would most like to see again right now. Right now, this moment, the answer that would spring most quickly to mind is Fellini's "La Dolce Vita" (1960). I've seen it, oh, at least 25 times, maybe more. It doesn't get old for me. Age has not withered, not custom staled, its infinite variety. I've grown so worked up just writing this paragraph that I want to slide in the DVD and start watching immediately. People asked me a few years ago why I included the movie in my annual Ebertfest, since it was, they said, hardly "overlooked," and the festival showcases films that deserve more attention. I said it was unlikely that more than a few dozen in the 1,600-seat theater would ever have seen it in a pristine 35mm print on a truly big screen. In gloomier moments, I wondered how many in the audience would never have seen it at all. What better definition of an overlooked film is there, than one want to drag everybody else to? But my purpose is not to tell you why "La Dolce Vita" is wonderful. It's in the Great Movies Collection. To that re-review, I might add that it is one of the most visually fluid movies ever made, a movie that approaches music in its rushing passion, not simply because Nino Rota's score is one of the best ever recorded, but because the characters seem to move with music within them (joyful, lustful, exciting, doubtful, sad). Fellini worked in Italy at a time of dubbed dialogue, and he sometimes played music loudly as he filmed a scene. That's why the characters often seem to be moving to unheard rhythms. Movies do not change, but their viewers do. 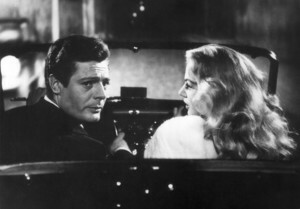 When I saw "La Dolce Vita" in 1962, I was an adolescent for whom "the sweet life" represented everything I dreamed of: Exotic European glamour, sin, the weary romance of the cynical newspaperman. When I saw it again, around 1970, I was living in a version of Marcello's world. Chicago's North Avenue was not the Via Veneto, but at 3 a.m. the denizens were just as colorful, and I was about Marcello's age. When I saw the movie around 1980, Marcello was the same age, but I was 10 years older, had stopped drinking, and saw him not as a role model but as a victim, condemned to an endless search for happiness that could never be found, not that way. By 1991, Marcello seemed younger still, and while I had once admired and then criticized him, now I pitied and loved him. And when I saw the movie right after Mastroianni died, I thought that Fellini and Marcello had taken a moment of discovery and made it immortal. There may be no such thing as the sweet life. But it is necessary to find that out for yourself. Of course I saw the movie many other times. Now it strikes me, among other things, as profoundly spiritual, and not simply because it opens and closes with classic Christ symbols. Opinion has come around on that. When I first saw it, "La Dolce Vita" was on the Condemned list of the Catholic Church. I knew views were changing when I was asked to introduce and discuss it before a convention of film educators who were all nuns. Then during the reign of Pope John Paul II, it appeared on the Vatican's list of great films with spiritual meaning. The first time I saw it, I confess I had lust in my heart. Anita Ekberg electrified me, and I was inflamed by the wild party at the end. In later years, I began to focus more on Marcello, as I should have from the beginning. The union of Mastroianni, story and direction is one of the most perfect trinities in film history. I saw the impatient hunger and ambition of youth. The life and death of Steiner providing, for Marcello, an idealistic inspiration and a crushing disillusionment. The role of his father, providing a template for what Marcello had become, and a warning of how he could end. Marcello's relationships with women, those of a man who objectified them, and was absorbed in himself. The Madonna of the fake miracle, counterbalanced by the real young girl in the final shots, who still cared about Marcello and wondered if he had continued with his book. The Christ symbol at the beginning, an air-lifted statue, which was "beautiful" but unreal. The symbol at the end, a fish, which was "ugly" but real. The sweet life along the Via Veneto, which was all-absorbing at the time, but now is long, long ago, as are most of the people who lived it.